Add rustic, Bavarian charm to your garden with this beautiful bench. A timeless classic, ideal for both public areas and gardens or patios, the curved design of the Harriet Park Bench adds Bavarian style and rustic charm to any setting while also offering comfort for relaxing. Treated to last, this is a bench suitable for year-round use. 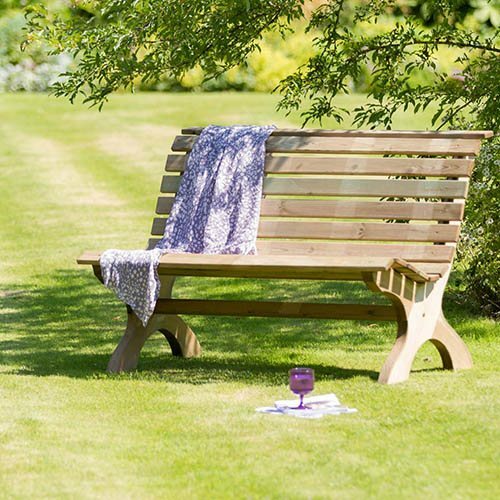 The Harriet Park Bench is manufactured from high quality, pressure treated, FSC® Certified timber to last longer, and comes with 10-year guarantee against rot so you can be sure that this product will last the test of time and remain a beautiful feature in your garden. Dimensions: 0.83m x 1.20m x 0.70m, assembly required - This product is 2-person assembly.